I stood in an empty room while he gathered the last of his things. I was wearing my fuzzy robe. It’s funny to think that a robe could be considered an act of self-care, but it is. Trust me, this particular robe has comforted me through all sorts of unexpected disappointments and losses. And this was a big one. I’d known the goodbye was coming. We’d planned our uncoupling the way most people plan weddings: with careful attention to detail, yet with a strange sense of excitement about the future ahead. It was well-orchestrated. Our eyes met as he walked toward me. My heart stopped. Tears welled up in my eyes. I wanted to throw up right there on the floor. As he got closer, he extended his arms and I immediately melted into them, just like I’d always done. It was a familiar place that I had once felt safe. But it felt different now. We said what we needed to say, and then all at once he released me. When the door closed behind him, all that was left was me…and my fuzzy robe, the only thing left to console me. Every ounce of my energy had been consumed by the move, this transition. For weeks, I oscillated between grieving and checking boxes off my to do list. Now, there were just a couple items left: acceptance and release. Thanks to self-care, I was able to predict what I would need in that moment long before we said our goodbyes. For more than a year, the Rate Your 8 exercise had been part of my morning ritual. It helped me determine how to best focus my time and energy in times like these. It hadn’t always been this way, though. Before I learned how to use self-care properly, sulking and ruminating were my crutches. I’d allowed negative memories and feelings to consume my thoughts. I wallowed. I felt sorry for myself. I relished the role of the victim. From the front window, I watched the first van we bought together, which was now towing a giant U-Haul, inch slowly down the driveway. More tears spilled onto my cheeks. I was sobbing now, and it was all sorts of ugly. In an instant the tail lights disappeared, and just like that, the life that used to be mine disappeared with them. As I sat alone, wearing that fuzzy robe, I decided it was time to redesign my life. 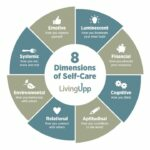 Learn more about the Self-Care Mastery Program here. This entry was posted in Self-Care News and tagged emotive, lifestyle redesign.